What is it that motivates us to spend time sitting in broken darkness, surrounded by strangers rustling packets of sweets, walking through day old popcorn as we shuffle by already-seated viewers, hoping that we aren’t wasting the next 2 hours of our lives? Is it the trailers we watch, the reviews we read, the recommendations we receive or just the fact we have nothing better to do on a Wednesday night? Aside from the last one as the cinema is always the better option (for me), what motivates me is a combination of all these things. The cinema experience, from the first time you hear about a film until the credits roll is just incredible. So when ‘Rush’ was sold out I didn’t mind seeing something else…! 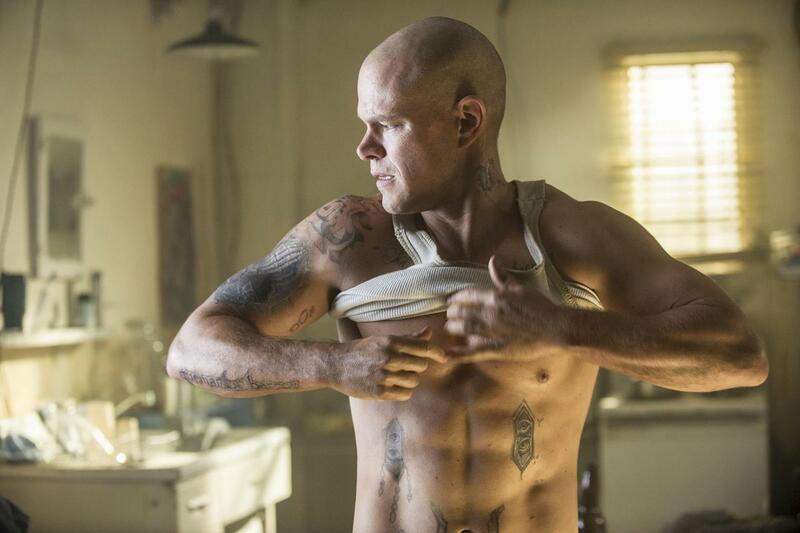 And that something else was Neill Blomkamps latest sci-fi epic Elysium. It is the year 2154 and Earth has become a poverty-ridden and dangerous place where all hope is lost and Earths wealthy inhabitants have fled for a life of luxury on the man-made space station Elysium, where the air is cleaner and the grass is greener than ever before. Fed up of the degradation and mistreatment of the Earth-dwellers, rebel man Spider (Wagner Moura) sends factory worker Max (Matt Damon) to Elysium in hope of bringing the two worlds closer together and restoring Earths human rights. Visually, Blomkamps second film is much like his first – District 9. We are presented with the same gritty handy-cam, blown away by beautifully polished special effects and taken on an adventure through action-packed sequences. 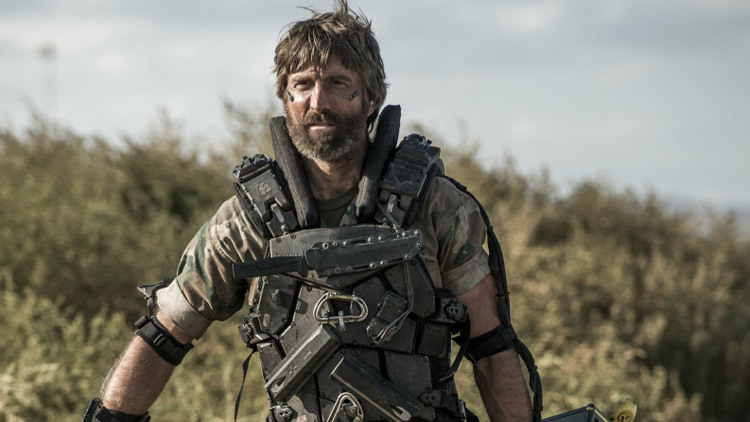 We even have 9’s leading man Sharlto Copley along for the ride, whose portrayal of sociopathic off-the-record bounty-hunter Kruger is both dark and mesmerizing. But Elysium is far from being the same film. Where District 9 amazed, Elysium falls slightly short. D9 was like nothing we had seen before on our movie screens, using techniques that had been around for years in a way so unique it created minimalism out of chaos and destruction and beauty out of dirt and dust. Its characterisation and plot were superb, ensuring that you really rooted for Wikus (Copley) in the unbelievable situation he found himself in. Elysium uses similar techniques but it is in the plot and characterisation that the films creativeness is lost. The characters are simple. Max, whose life hangs in the balance, finds more motivation to go to Elysium from his childhood love interest than from his chance to live by using one of the perfected worlds ‘healing tables’, and Kruger is driven only by his own greed and thirst for power, much like Delacourt, the bizarrely spoken and acted protector of the picturesque satellite, played by Jodie Foster. Moura’s Spider comes across as having real depth, as he puts in a powerful performance that real steals the show for me, but again his motivation is simple; he wants Earth back to how it was before. It is difficult to speak at any length about people you never really come to know. And then we come to plot. The film is clearly a representation of Earths current issues and Blomkamps viewpoints regarding poverty, class and global warming – a world of poverty and decay looking up at a world full of promise and wealth – but it fails to truly explore these issues through anything but visual representation. Instead it becomes more of a quest, where Max and Spider hope to save planet earth using guns, exoskeletons and computer chips. There are some amusing holes that can also be explored such as Damon’s exoskeleton being drilled into his skull using screws that are easily three inches long and therefore surely fatal, and the Hollywood-esque love interest is not needed at all (surely saving the entire planet is motivation enough Max). But despite ALL of this, I still left the cinema reasonably satisfied. I guess the question is, did I end up being disappointed that ‘Rush’ was sold out? The answer is no. Not really. Although it is far from perfect Elysium is an enjoyable watch where Damon holds his own despite not having a lot to work with, Moura and Copley make for a strong supporting cast and the worlds we see before us are breathtaking. Visually it has something of a 1960’s and 70’s sci-fi era feel to it, particularly with its likeness to both 2001 and Star Wars (the smooth white sets juxtaposed with rust bucket spacecrafts) but it lacks anything resembling their timeless power. Elysium is a thrilling ride that manages to capture the simplistic and effortless nature of its director, and although it is by no means time wasted, it does leave a slightly bitter taste in your mouth. Blomkamp, we expected more. Selling Point – Whilst Damon makes me slightly weak at the knees, Moura and Copley steal the show. Quote-a-rama – Kruger – ‘It’s just a flesh wound’. If in doubt, go funny. This is a message to all of you. My incredible followers who have been consistently reading my blog over the last month. Recently I have moved home and have been without internet,so apologies for the lack of up to date reviews. And many more. Feel free to message me with any thoughts on these,or let me know if you were at any of the gigs and I will gladly include your thoughts in my blog entry. Again thank you for the continued support.